"Tulasi is auspicious in all respects. Simply by seeing, simply by touching, simply by remembering, simply by praying to, simply by bowing before, simply by hearing about, or simply by sowing this tree, there is always auspiciousness. Anyone who comes in touch with the Tulasi tree in the abovementioned ways lives eternally in the spiritual world." Worshiping Krishna’s devotees is an essential feature of devotion to Him. Sometimes great devotees appear in forms other than the human form. 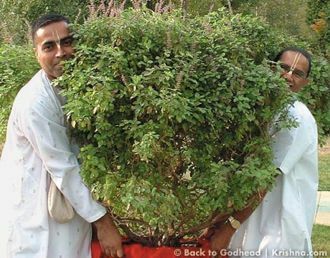 One such devotee, whose worship is central to the worship of Krishna, is Tulasi. She serves Krishna in the form of a plant, and devotees worship her in that form. Full of love for Krishna, she can give it to others. The wood of dead Tulasi plants is used to carve sacred beads devotees wear around their necks and use for chanting the Hare Krishna mantra. Tulasi is always grown at Krishna temples. Like the deity, she is offered arati. Many devotees of Krishna keep and worship Tulasi at home.